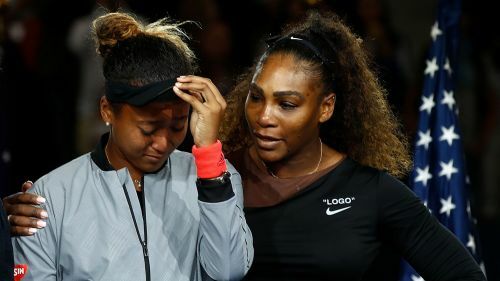 Naomi Osaka admitted she was "a little bit sad" her US Open triumph ended in boos after Serena Williams was embroiled in a controversial row with the umpire. Williams was initially angered at being issued a code violation by umpire Carlos Ramos after a gesture from Patrick Mouratoglou in the player's box was deemed to be coaching, contravening grand slam rules that do not apply on the WTA Tour. The American was then handed a point penalty for smashing her racquet as she trailed in the second set and, after calling Ramos a "liar" and a "thief", she was docked a game. Osaka kept her composure to complete a 6-2 6-4 triumph, but the start of the trophy presentation was met with further jeers, resulting in Japan's first major champion crying and apologising to spectators. "I felt a little bit sad because I wasn't really sure if [the crowd] were booing at me or if it wasn't the outcome that they wanted," Osaka said of that moment on NBC's Today. "I also could sympathise because I've been a fan of Serena my whole life and I knew how badly the crowd wanted her to win. I don't know, I was just really emotional up there. "I felt like everyone was sort of unhappy up there and I know that it wasn't really... the ending wasn't what people wanted it to be. "In my dreams, I won in a very competitive match, so I don't know, I just felt very emotional and I felt like I had to apologise." "I felt really happy because she knew I was crying and she was saying some things and it just made me happy overall," added Osaka.